An inexpensive alternative to harbor cruises or tour boats, is the MBTA water shuttle to Charlestown. The route number is F4, and operates from Long Wharf in Boston to the pier next to the Charlestown Navy Yard. Superb views of Boston from the inner harbor can be attained on this ferry, and the fare is less than $4.00 for a round-trip ride. The boat departs from Long Wharf, with the nearest MBTA station being Aquarium on the Blue Line. The ticket office is diagonally across from the entrance to the Marriott Long Wharf Hotel, with an adjacent dock for boarding the boats. As the ferry leaves the Long Wharf, passengers can get excellent views of the old Custom House Tower, Marriott Long Wharf Hotel, and New England Aquarium. The boats then pass by Battery Wharf and the Coast Guard Station. The Charles River flows into the harbor near here, and a great view of the Charlestown and Zakim bridges are seen. Finally, the USS Constitution is in view as the ferry passes the Navy Yard. The Tobin Bridge and East Boston are on the opposite side of the harbor from here. The ride takes only 10 minutes, but if one has little time to see the city, or going to the Constitution or Bunker Hill Monument, it’s well worth the fare. The boat operates year-round, with more frequent service during summer. 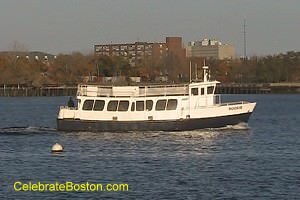 At the time of this writing, this ferry does not operate on Thanksgiving and Christmas Days, so the MBTA schedule should be checked during the off-season before planning a trip. In anticipation of the Big Dig completion in 2003, and an expected increase in tourism, the MBTA had instituted ferry service to various points in Massachusetts Bay. For more than 200 years, many commuter boats had operated in the harbor. During the 1800s, there was the Winnisimmet ferry to Chelsea, the north and south ferries to East Boston, and the Boston, Revere Beach and Lynn Railroad ferry to their narrow gauge line in East Boston. The Blue Line under Boston Harbor was completed in 1904, and this created great competition between the streetcar and ferry lines. The Sumner Tunnel for automobiles opened in 1934, and this was a fatal blow for ferry service for many years. Of strange note, the first UFO sighting in America was observed in 1644 near Battery Wharf. Strange lights appeared over the water for couple of days. The Charlestown ferry passes over the spot where this strange phenomena was seen in colonial times. The MBTA also operates water shuttles to Logan Airport, Hull, Hingham, and Quincy. The waters shuttles are a great alternative to the subway lines for many commuters. Walking Directions: Exit the station, and walk east toward the ocean. The ticket office is located diagonally across from the front entrance of the Marriott Long Wharf Hotel. After debarking the boat in Charlestown, walk to the end of the dock, and then left to the USS Constitution Museum and ship.